Margaret writes to Jessie about upcoming dances and shares their mother’s advice for fending off a persistent suitor. I would have got my letter off sooner if I had been able to have all my time to myself to-day but Cousin Hattie and Lil and Sal have been here since 12.25 and we have been busily showing them the town. Oh they are all so lovely. I couldn't possibly tell which one I love the best. Of course you know, I think I told you that Lil is engaged to Mr Dalles's brother who came down with them. She is so sweet and happy and yet, so dignified. Mr Dalles is extremely nice but not good looking enough for her. Now for your questions. Mother says that you are perfectly right in your feeling that you don't like to accept so much from Mathew just because he is taking you to the dance. She 'advises' you to do thus and thus. Before the glee club—tell him that Mother prefers you not to tie yourself going to the glee-club and dance in one evening—put it nicely of course—Also refuse the Triangle Club tell him that you have seen it once. Accept the Yale game—tell him that you don't mind sitting on the open stand. If you would rather go to the Triangle Club with him refuse the Yale game—I will write a few lines in the moring it is going on eleven now and I am tired.Margaret and I received invitations to the Tower Club dance on Friday night, but, as I can't be in two places at once, I shall not go. Am sorry, should like to go to it, and meet some of the men that you will meet, at the June dance. No one has asked Little Peggy. 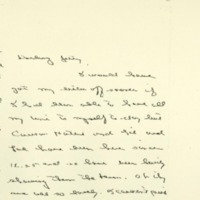 Wilson, Margaret Woodrow, 1886-1944, “Margaret Woodrow Wilson to Jessie Woodrow Wilson Sayre,” 1907 May 21, WWP17397, Jessie Wilson Sayre Correspondence, Woodrow Wilson Presidential Library & Museum, Staunton, Virginia.